Do you know why vegan cooks are so creative? 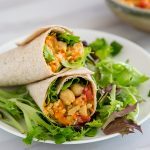 I think it’s because we’re constantly being tempted by interesting dishes on restaurant menus that are “vegan except for.” You know, the chickpea appetizer that is vegan–except for chicken broth. Or the hash browns that are vegan–except they’re cooked on a griddle alongside bacon. Or the portobello fries that are vegan–except for buttermilk. Going out to eat and having one vegan-looking dish after another turn out to contain just one (usually unnecessary) non-vegan ingredient is enough to make some people throw up their hands and vow to do all their own cooking. I look at it as a challenge (I can usually get the kitchen to make something vegan for me) and as a source of inspiration. Portobello fries sound good; therefore, I will find a way to make them not only vegan but also oil-free. Take that, restaurants of the world! I noticed portobello fries on the menus of two local restaurants recently, one of which served it with Spicy Horseradish Comeback Dressing and declared “Taste why so many other restaurants try to copy our signature appetizer.” Hmmm, I thought. 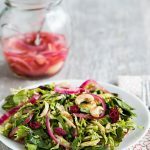 Horseradish comeback dressing sounds delicious, and if everyone else is copying it, why shouldn’t I? 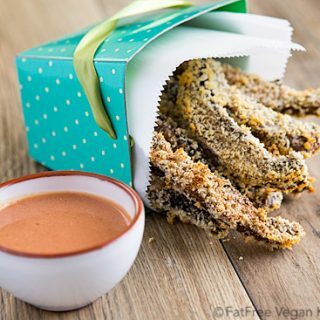 Since I haven’t actually tasted any portobello fries, I looked to non-vegan blogs to learn how they’re usually made and found an easily veganizable recipe at Inspired Taste. I’ve made baked portobello fries a few times now, enough to feel comfortable enough to do it on a video so that you can see how easy (but messy) it is. There’s one possibly unfamiliar word in the video and recipe, and that is “aquafaba.” That’s just fancy Latin for “bean water.” It’s the cooking liquid from a can or pot of chickpeas, and it makes a great substitute for egg in this recipe, especially if you chill it first so it gets thick. If you haven’t been saving your bean water, you can still make the recipe using soy milk or other non-dairy milk, but I recommend adding a little flax or chia as a thickener. 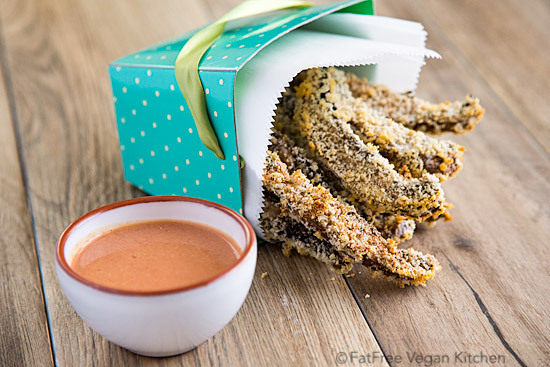 Crispy on the outside, tender on the inside, these baked portobello fries are vegan and completely oil-free. 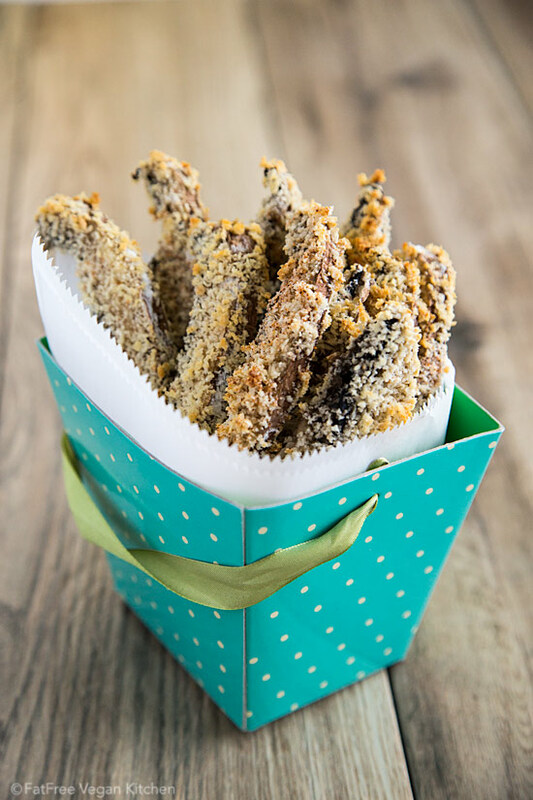 To make gluten-free portobello fries, substitute rice flour and gluten-free bread crumbs. Trim the stalks of the mushrooms. If desired, you can scrape out the gills (but I find the mushrooms break easily and doing this doesn’t make much difference). Slice mushrooms 1/4-inch thick. Put the flour, aquafaba (or other liquid), and panko into shallow plates. Dredge a mushroom slice in the flour, coat with aquafaba, and then press into the breadcrumbs, making sure it’s completely covered. Place on lined baking sheet and repeat with remaining mushrooms. Bake at 425 until crispy on the outside but still tender inside, about 12-15 minutes. You may turn the fries over halfway through if you want them extra crispy. Serve with Horseradish Comeback Sauce, below. They also make a great portobello burger. Aquafaba is the liquid from cooked or canned beans (usually chickpeas). It makes a great substitute for egg in this recipe, especially if you let it refrigerate it beforehand (it's thicker and more egg-like cold). Soy milk, almond milk, and other non-dairy milks also work, but they work better with a little flax seed meal added to make them thicker. Try adding 1/2 teaspoon of ground flax and allow to thicken for a few minutes. If your bread crumbs are seasoned, use less Creole seasoning to avoid over-salting. The last time I made portobello fries, I skipped the dipping and used them as the filling on a portobello burger. So good! 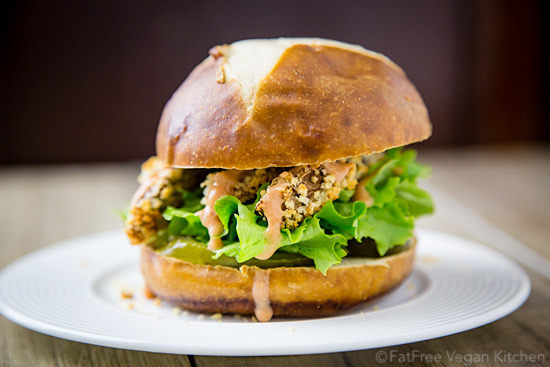 The Horseradish Comeback Sauce makes a spicy replacement for both ketchup and mayo. This spicy, horseradish-infused sauce isn't like any other you've had. You'll have to come back (get it?) for more! Whisk all ingredients except hot sauce together in a small bowl and allow to stand several minutes to thicken. Add hot sauce to taste. Flavor will deepen and develop over time. You can make this using soy milk instead of onion cream, but you will need to add 1/4 teaspoon onion powder for flavor and at least 1 teaspoon of ground flax or chia seeds for thickening. Allow to stand for at least 15 minutes before serving. Thanks, Maria! I’m finding aquafaba more and more useful. I know exactly what you mean about the “Except for the….” with my soy allergy it’s pretty frustrating. I’m happy to see you using aquafaba. I just read an article about it and i’m very interested in its qualities that make it a sub for egg whites. Thanks, I’ll be trying these tonight and I’ll let you know what we think. Hi Susan, I’m loving everything about this recipe! I would totally put these fries on a burger with pickles and that tasty-looking horseradish sauce. Also, I just voted for your blog on the VegNews Bloggy awards–fingers crossed that you win! OMG……..your fries look absolutely delish! Definitely going on the ‘must try soon list’. It’s my pleasure to vote for you on the Vegnews site. I’ve made these twice now……..sooo good! They are delish with or without a sauce. Have to get busy & make the onion cream next. I love your blog and wish to thank you for all the help you’ve given me in going vegan (5 years vegetarian then 3 years vegan). Also, a variation suggestion: substitute mild sriracha for the catsup and skip the hot sauce. The recipe looks delicious and I can’t wait to try it. Have a great vacation in England. I hope that you have left enough time to browse the Victoria and Albert museum, let alone the British museums. The City of London museum is quite small and I thought it was quite delightful the last time I visited it, years ago. Then there are the interesting places outside of London, my Dad’s home town of Arundel, in Sussex, complete with its castle. It’s the seat of the Duke of Norfolf. Then there is York and the Lake District. How long did you say you were going for? If all else fails I guess you will just have to go back! Enjoy yourself . Love this blog. Voted for you, of course! Vegetarian since college, then became vegan in 1992 when I learned the truth about dairy and egg production. For me, it’s all about the ethics, and my deep love and concern for all animals. I’m also a rescuer, animal advocate, petition signer, and environmentalist. The veggie lifestyle, and resources for actually tasty food, have come a long way since I first decided to stop eating animals. I remember when my entire family was sure I would die without eating meat. But the happy side effect of my choices, is that I’m the healthiest person in my family–and my heart and soul are at peace. Liz, I think the tomato purée with a dash of vegan Worcestershire sauce would probably work. You could add a little bit of something sweet, too, if you felt like it needed it. I don’t keep ketchup on hand either, and I often come across a recipe that requires a small amount. When I’m out at a restaurant I will grab a couple of the ketchup packets and keep those in the cupboard at home for when a recipe calls for a few teaspoons or tablespoons of ketchup. first thing first- I voted for you at Vegtimes, and hope you win. I’ve been enjoying your recipes for a month now, since I made the decision to follow Dr. McDougall’s plan for healthier eating. Unfortunately, I haven’t been able to make or eat a single one yet, because I am doing 90 days of nothing but potatoes to eat. And they look soooo good. I am going to make the comeback horseradish sauce as a condiment for my potatoes, though! But, from someone who still watches as much Food Network as ESPN, and grew up watching Julia Child on PBS on weekend mornings, I just wanted to say thanks for your recipes and creative blog. 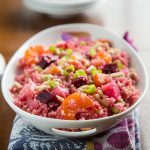 Your blog gives me hope that I can still love good food just as always, but enjoy a healthy lifestyle, too. Thanks for what you do! The portabello “fries” sound wonderful and I’ll try them this week. I’ve already been using your Onion Cream as a base for several dressings and sides. It’s great. That said, I have one question/concern. I follow a whole food, plant-based diet, and usually can adapt recipes to this regimen. This rules out all processed oils, such as anything you can buy. For the portabello recipe, I am going to try to use ground pistachio nuts, ground walnuts, or even ground peanuts. (I’m allergic to cashews, so they are out.) Ground flax seed, which I thought of first, may thicken the batter too much. Any ideas? I’m confused. Which ingredient are you trying to substitute for? 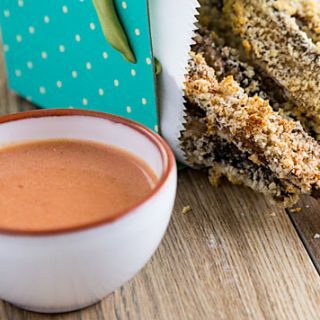 There aren’t any oils, processed or otherwise, in the portobello fries recipe unless you use the flax seed that’s recommended if you don’t use aquafaba. Oooh I love portobello mushrooms. Those look so meaty and delicious =O Aquafaba as the dredge is so smart! I don’t know why I haven’t been doing this sooner!! Wow! These look amazing. I can’t wait to try them for dinner tomorrow! “The mushrooms are great” quote from DearHusband at dinner. 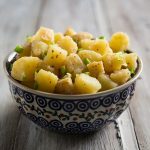 They turned out wonderful – I had aguafaba in the freezer – no substitutions necessary. Thank you! These were great! I used whole-wheat panko and they were incredibly crisp and crunchy. I only wish I would have cut the portobellos a little bit thicker. And I’m wondering if this would work with a whole, unsliced portobello, then onto a burger bun? I don’t care much for most portobello burgers…think I’ll try it! Thank you. Cool! They remind me of avocado fries. They must be absolutely delicious!! Will give them a try. I just want to thank you for your facebook and blog page. I am really trying to become vegan and struggle with finding recipes that look and taste good. Last night I tried your easy curry tofu scramble and absolutely LOVED it. I can’t wait to try more of your recipes. Thanks for inspiring me to be more adventurous and giving more options in the vegan department!!! Just been looking through your recipes – what a fab collection. And thanks so much for this one, I’ve never heard of Portobello Fries before but now know what I’ll be making for dinner tonight! You are brilliant. This is my fav and I have really started liking your website. It’s having almost all dishes under one umbrella. Great. I made the mushrooms, and also made some zucchini sticks using the same method… Delicious! The comeback sauce is amazing. I use it for so many things. It’s delicious on your vegan hot dogs, I’ve used it on salad, almost anything! I added some diced sweet pickle relish and it tastes like thousand island dressing! Yummy. Ooooh! I am so excited about these!!! Now you’ve got your air fryer, give these a whirl in it. That’s what I’m going to do for supper tonight! !